Although Valles Marineris originated as a tectonic structure, it has been modified by other processes. This image shows a close-up view of a landslide on the south wall of Valles Marineris. The region shown here is east of that shown in slide #6. This landslide partially removed the rim of the crater that is on the plateau adjacent to Valles Marineris. Note the texture of the landslide deposit where it flowed across the floor of Valles Marineris. Several distinct layers can be seen in the walls of the trough. 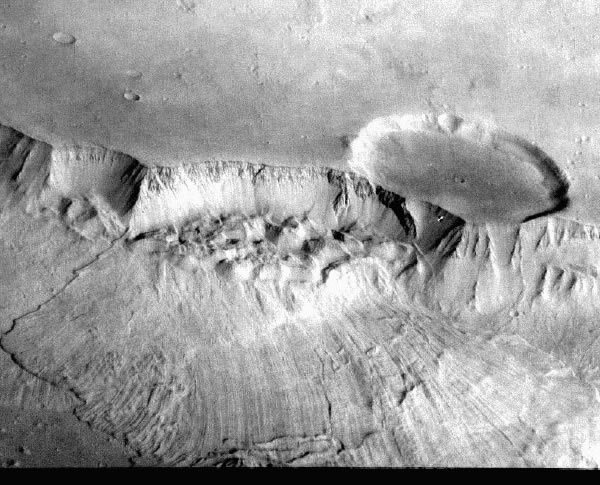 These layers may be regions of distinct chemical composition or mechanical properties in the martian crust. This image is 60 kilometers across. An interactive map of the features in this image is also available.